It’s true that, compared to the cost of private schools – and maybe even other public institutions, I’m not sure – CUNY is pretty cheap. But it’s unwarranted to leap from the observation that CUNY tuition is relatively less expensive to the judgment that CUNY students have nothing to complain about. The first reason is that, for many students in CUNY’s target demographic, $300/year is a significant amount of money. When you consider that the $300 hike is slated to happen once per year for the next five years, it becomes less controvertible that the increase is significant. A student in her first year at a four-year CUNY school will pay an additional $1,800 over her next three years, an increase of about 11% over what her tuition would be at current rates. (The percentage is higher at community colleges.) Even if you know nothing about CUNY students, there’s no question that an 11% (or higher) increase is something worth getting upset about. And there’s something more insidious lurking behind the “they’re spoiled” sentiments: the idea that the insane costs of higher education are somehow “normal”, or even “the way things ought to be”. Charts like this one (assembled here from Consumer Price Index data) suggest that tuition increases have outpaced inflation by about two to one in the past decade or so. Unless wages have also outpaced inflation in this way (which, ahem, I doubt they have), it means that college tuition is, in some objective sense, a greater proportion of income than it used to be. Why should this seem right? Is higher education is a privilege that should be available only to people with financial means? In what way is income a meaningful indicator of who should be able to go to college? Look at it another way. If the “CUNY students are spoiled” comments comes from people who are pissed off about the fact that they pay far more for their private schools – if it’s sour grapes – then it’s downright idiotic. People paying outrageous tuition to private schools, scraping by only by recourse to enormous student loans, should be right alongside of CUNY students, fighting the cultural sentiment that allows their $40K tuition to seem somehow acceptable. I fall into this category myself. My student loan debt is staggering. My wife and I make good money, and pay off large amounts of principle on our loans every month – but still we’ll be 40 before they’re paid off. If this is normal, then “normal” is something that we should all be resisting. Date: November 22, 2011 · Author: Boone Gorges. Yesterday I attended the Annual Symposium on Communication and Communication-Intensive Instruction at Baruch College, put on by Mikhail and the fine folks at the Bernard L Schwartz Communication Institute. I’ve got a couple of blog posts in the hopper that are inspired by conversations that happened there, but for now here’s a quickie. All this is to say that TBs are good for conferences and conference-goers. What makes TBs a good induction into Twitter is the act of witnessing these benefits. When I attended the 2008 CUNY IT Conference last year, I expected it to be like most conferences I’d attended – good in parts, but largely isolating and kind of boring. Given these expectations, experiencing the benefits of that conference’s TB was exhilarating. I knew before going to this conference that Twitter could be a fun performance space, maybe a good place to share links – but seeing it in action as a TB was what really sold me on the technology. 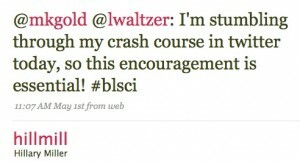 Here’s hoping that #blsci had a similar effect on @hillmill and the other relative Twitter-newbies who experienced the event’s TB. I’d be interested to hear whether this has happened to others. Have you attended an event where the TB changed the way you think about Twitter? Date: May 2, 2009 · Author: Boone Gorges.